I hadn’t seen Kevin or Christine in ten years. When I first met them, I was a teenager and they were a young married couple who had recently joined our church. Eventually they rented the house next door to my parents, and had their first son, Kell. Kell was only a year old when Kevin’s job with the railroad forced the family to move to Michigan. Over the years my folks have managed to see them a handful of times, but I never had the chance. Several years ago they moved back to their home state of Alabama, which is where they were when I knocked on their door. I enjoyed some long overdue hugs with the Kevin and Christine when I walked in the house. Kell is eleven now, and the oldest of their three boys. I recognized him the minute I saw him, which is strange since I normally have trouble recognizing my own family in baby pictures. Kell looked at me with a mix of happiness and trepidation, and I could tell that Kevin and Christine had explained to the boys that I knew Kell when he was a baby. As the youngest in my family, I’ve been in a similar position plenty of times. I’m often called to feign recognition of people I met when I was too young to remember, and I did my best to assure Kell that it was okay if he saw me as a stranger. For Logan’s part, he came right up and asked if I knew him already. I told him no, since he was only four and I hadn’t seen the family since they left Seattle. Ian, age eight, chimed in with various questions trying to ascertain the exact relationship I had with his parents. How old was I when I knew them? How old were they? Where was this? Was he born yet? What about Logan? The two youngest boys then insisted on giving me a tour of the house. While adults are inclined to show you the bathrooms, the room you’ll be sleeping in, and where the extra towels are kept, children have a very different view of their own home. This is where Ian keeps his toys. That is Kell’s train. This is a bathroom. That is a toilet. This is Mom and Dad’s room. This is Dad’s side of the bed and that is Mom’s side of the bed. This is where we eat. That is a chair. They also have a black cat that was found in a pipe, named Piper. Piper is one of the most accommodating cats you will ever see. This is a necessity if a cat is to live with an eight-year-old boy who is in love with her. Ian is constantly picking Piper up, hiding her inside boxes and closing the lids, and throwing stuff on top of her. Piper does almost nothing in response, which seems to be in everyone’s best interest. While the parents made dinner I was pulled into Ian and Logan’s room to play an intense and elaborate game of make believe. There were dinosaurs. Time went from day to night. For some reason I had to hide in the closet. Logan insisted we need to build a fort, and Ian responded with confidence, “I got this.” The boy is a regular engineer. After dinner and a lengthy argument about why Logan had to sleep in his own bed and couldn’t sleep with Katrina in the play room, the two youngest boys went to bed. As the evening started to wind down, the adults began to reminisce. We talked about what we remembered from Seattle and what has happened in the ten years since. I commented on how laid back Piper was, and the night ended, as so many do, with us watching youtube videos of Maru the Cat jumping into boxes. I woke up the next morning when Logan crawled into the bed next to me. He was trying to be sneaky and I wasn’t ready to get up, so I pretended not to notice. Eventually he tired of this game and left. A few minutes later he came back, got into the bed, and then left again. 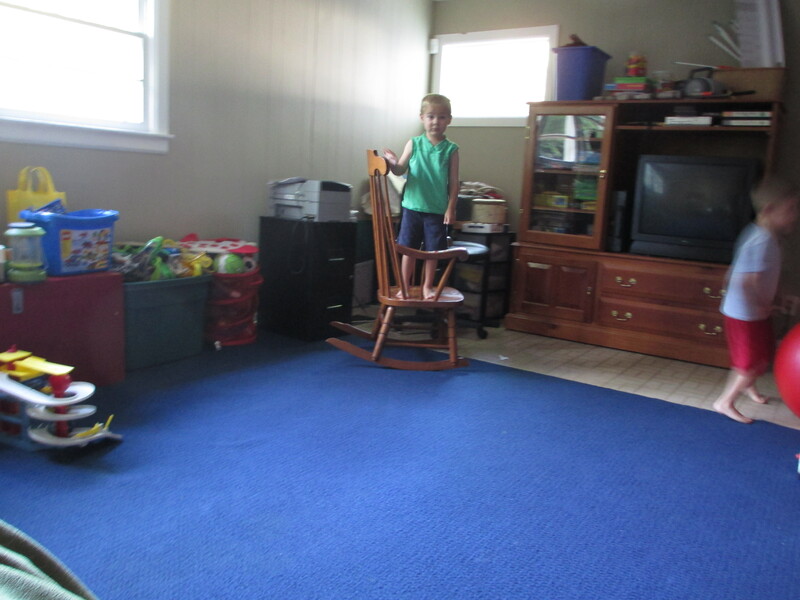 As the house began to fill with sound I got up, and at Logan’s insistence played another round of make believe, which he referred to as “that same game we played before.” Almost nothing about the game was the same. At one point we had all been shrunk down to a very small size. We had to rescue ourselves. Christine invited me to join her and the boys to go swimming at the local YMCA. We got all of the boys ready to go and showed up at the pool door to find there was a camp using the pool today. It wouldn’t be open for another twenty minutes. For those of you who are not used to caring for a set of three young boys, twenty minutes is a gruesome length of time. Christine loves her children, but they are clearly a handful. I could see the blood drain from her face at the thought of standing outside the pool with three anxious boys for a full twenty minutes. We made it through. It wasn’t easy. At once point Logan headbutted me in the stomach. I don’t know why and neither did he. In order to swim in the deep end, children have to pass the swim test without using googles or floaties. To pass, one must swim under the dividing rope, get to the wall, and swim back. Kell has long since passed his swim test and sports a small plastic necklace to prove it. Ian is practicing for his test, though he’s clearly got a ways to go. When we got into the pool, Ian clung to his mother so that she could help him practice. Logan clung to me since he can only barely swim. Kell was tall enough to reach the bottom, and was therefore mostly on his own. Over the next 45 minutes Christine and I played a game of pass the child, taking turns for which little boy would be clinging onto us for dear life as we walked around in four feet of water. Ian practiced going under the rope (which mostly consisted of him insisting he wasn’t quite ready yet), and Logan, Kell and I played with the floaties as we jumped and splashed around. The entire time we were in the pool I don’t believe I spent more than 10 seconds without a little boy clinging to my arm, and Christine had even less free time. When we finally got out of the pool and the boys were drying off, I looked over to Christine and asked, “So how do you do this when it’s just you?” She sighed and shrugged and looked exasperated, indicating she had no idea. After meeting up with some people in Montgomery, I drove back to the suburbs hoping to catch Kell’s wreath laying ceremony at the Prattville Cemetery. It was Founder’s Day, and Kell and his Boy Scout troupe were supposed to participate in the ceremony to lay a wreath on the grave of Daniel Pratt. I was running a bit late when I got a text from Kevin indicating that the heat, combined with the size and volume of mosquitos, was making for a pretty miserable ceremony. He suggested I was better off going straight to the house and meeting them there. They wouldn’t be staying much longer. Once they returned the three of us set out for the city again so they could show me the sights. I was excited to get to spend some time with Kell. While Logan and Ian are great, they tend to dominate the situation, and as a result I hadn’t had much time to hang out with Kell, who seemed like he had turned into a pretty smart and interesting young kid. Kell loves trains, and we pulled over to watch a few cargo cars pass through the city. We saw the “First White House of the Confederacy,” as well as a civil rights memorial art piece that unfortunately was under construction. I talked with Kell about Loving v. Virginia, and he told me about what they learn in school regarding civil rights. At the Capitol Building I took one of my favorite photos of the trip. 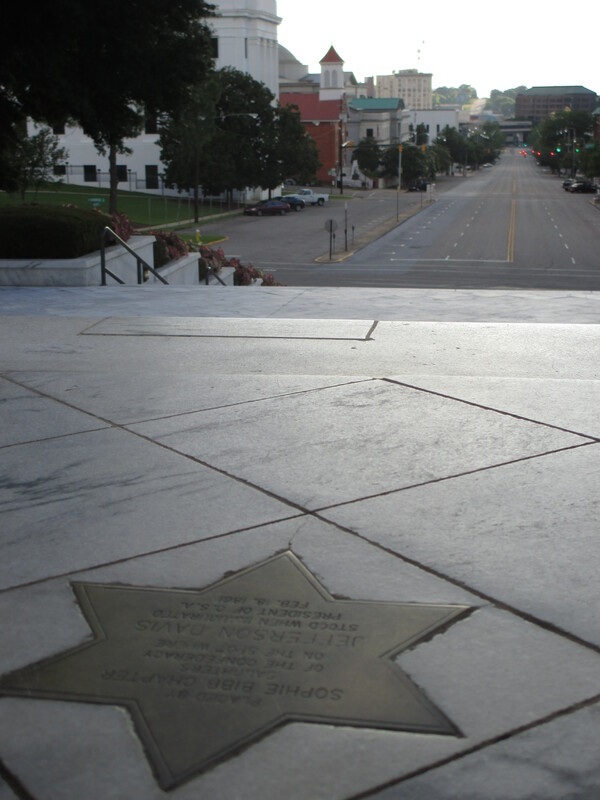 From the top steps you can see a star memorial on the ground indicating the spot that Jefferson Davis stood as he was sworn in as the first president of the Confederate States of America. One block down the street is the red-brick Dexter Avenue Baptist Church where the struggle for civil rights is said to have begun – the church where Rev. Martin Luther King preached. So much happened between the foreground and the background of that photo. As Kevin, Kell, and I were pulling into the driveway back at the house, I noticed a cat I hadn’t seen before in the yard. I pointed it out, and an excited Kell yelled, “Where is it?” The cat darted behind our car, Kevin pulled in to park, and Kell hopped out. I looked out into the street to see where the cat had gone, and it was in the street violently seizing. I had never seen such a thing. It was so horrifically unnatural – it belonged in a movie about black magic. The cat had been hit by a passing car. Kevin and I watched as the convulsions slowed to a stop, and the cat became motionless. I looked around for Kell, who was no where to be seen. “Perfect timing,” Kevin said with a sort of sad sarcasm he’s always been good at. Kevin explained how Kell is especially sensitive about animals, and takes it really hard when he sees animals in pain. We walked in the house and Kevin started calling out for his son to make sure he was alright. From the kitchen we heard Christine yell, “He’s in here.” We walked in to find Kell pressed into his mother, hugging her so tight she could barely hug him back. After awhile he let go, and sat at the kitchen table wiping away his tears. “Do you think the cat be okay?” Kell asked his dad. We all ate dinner, and Kevin gave Christine a break from the kids. She took me to downtown Prattville to see the end of the Founder’s Day festivities. Most of the activities were closing up, but we managed to walk around and see a few stores. There was a man dressed up as Daniel Pratt, and a woman dressed as his daughter. It’s a small town, and Christine kept running into people she knew. Most were other parents, and they talked about the latest updates on their respective children. Back home, the family had dinner and Logan and Ian were put to bed. This is when I found out what Kell had whispered to his mother earlier. Ian has a bad peanut allergy, but it’s not nearly as bad as the fear of peanuts he’s developed as a result. Which is why the family always eats SunButter and why Ian doesn’t know that there’s a jar of peanut butter hidden on the top shelf of the pantry. Christine pulled out the peanut butter and a jar of jam from the fridge. Kell had asked his mother for a secret peanut butter and jelly sandwich. I stayed up late talking with Kell. He’s a good kid, and Kevin and Christine are just as wonderful as I remember them. Before bed Christine walked up to me with a big smile, holding a box she had found in the recycling bin. She put it in front of Piper, and the cat jumped inside. 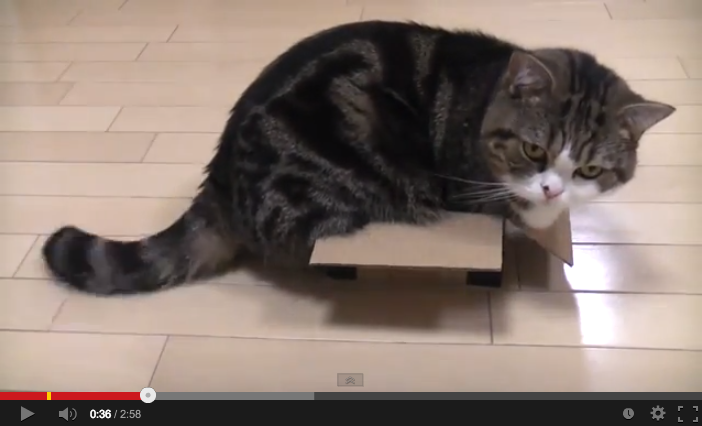 Just like Maru.